Fantastic production and strong lyricism are slightly hindered by a sometimes snooze-worthy flow on Skyzoo's official debut, The Salvation. For many hip-hop heads, Skyzoo's The Salvation is an album they never thought they would actually hear. It never got quite to the level of Dr. Dre's Detox, but who could blame the Brooklyn emcee's fans for thinking this day would never come? Amid label issues (big surprise there), Skyzoo dropped a slew of mixtapes, most critically lauded, and in 2006, he released his "debut" with help from producer 9th Wonder named Present Cloud 9: The 3 Day High. Hip-hop heads wanted something real, though that meant no more unofficial albums or mixtapes. 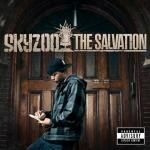 Now, fans get just that, Skyzoo's first studio record, The Salvation. For the most part, the skilled wordsmith delivers. His lyrics are solid from front-to-back, no matter the subject matter. He tackles a number of standard topics, such as the darker side of the industry ("The Necessary Evils") and the concept of being a hit-maker ("Popularity"), but he does so with a sincere tone and ease with words you can't help but follow along. An instant standout is the gorgeously crafted "For What It's Worth", a sonic piece of beauty laced with some of Skyzoo's best storytelling. He tackles the idea of wanting to do what he wants to, even as "time keeps talking" and passing by quickly. The issue at hand across the album, though, is Skyzoo's cadence remains identical on nearly every track. His flow and voice are not engaging in the typical sense, and some listeners will be instantly turned off. Hell, some of his fans will probably wish he had switched up his flow at least once. Sure, he spits a few bars differently on "Penmanship", but it's short-lived. He sticks mostly to the script, for better or for worse. You have to give him credit for at least addressing this well-known criticism on "Dear Whoever", though. Aside from a few less-than-stellar beats, such as 9th Wonder's by-the-numbers soul-sampling "The Beautiful Decay", the production remains consistently fantastic. The other beatsmiths definitely brought the heat for Skyzoo, though, and they include Just Blaze, Needlz, Illmind, and Black Milk, among others. Even with that varied list of producers, the album's sound is cohesive. They knew what this emcee was looking to do, and that quality paired with Skyzoo's ridiculous lyrical skills are what make The Salvation an engaging listen. Again, the aforementioned issue with his voice and flow will leave some listeners unsatisfied. If he had spit with a bit more variety, there is no telling how dope this album could have been.